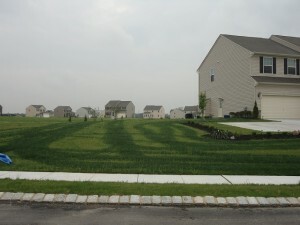 Turf response to a uneven application of N fertilizer. As the start of the 2013 growing season draws near, I thought an update on the Professional Fertilizer Applicator Certification and Training (ProFACT) program would be useful. Be advised that all professionals need to be certified or trained to apply fertilizer to turf in NJ. Additionally, all certified and trained professionals need to renew their certificate for 2013 before applying fertilizer in 2013. Recall the that N & P fertilizer cannot be applied to turf (lawns, park, sports fields, etc.) in NJ before March 1st. There were 1,634 professionals that received training and passed the exam to become a Certified Fertilizer Applicator in 2012. To date in 2013, another 133 professionals have become a Certified Fertilizer Applicators. And 1,101 Certified Fertilizer Applicators (CFAs) have renewed their certificate for 2013. Also, there were 619 Trained Fertilizer Applicators (TFAs) registered in 2012. We are in the process of upgrading the TFAs registration process, which should be available on February 22 (Friday). The new process for registering TFAs should be more straightforward than last year and is described below. CFA attests to the fact that each TFA has been properly trained (training materials on ProFACT web site). CFA pays for TFA, which may be done for multiple TFAs by checking a box for each one (Please be advised we have a programming issue and will delay payment for TFAs. We will notify you via email when the payment step is functional). Name is automatically added to the web site list of TFAs. CFA prints out certificate for each TFA, clicking a link beside each TFA’s name on the status page. Certificates for TFAs, like the CFAs, can be reprinted at any time. Looking ahead for the ProFACT program, we hope to be receiving some funding to develop printed training and exam materials in both English and Spanish (many have requested this). As part of this funding, we anticipate conducting up to 3 off-campus training and exam sessions later this year. Stay tuned for more information. Professionals seeking more information on training and taking the exam are referred the ProFACT web site for more details. Best wishes for the 2013 growing season!